Construction Company is child theme of Construction Landing Page WordPress theme. It is a free construction WordPress theme for construction companies and businesses. Contractors, building services, construction companies, interior design agencies, architects, plumbers, packers and movers, landscapers, and any construction-related businesses and companies can build their landing page websites with Construction Company WordPress theme. 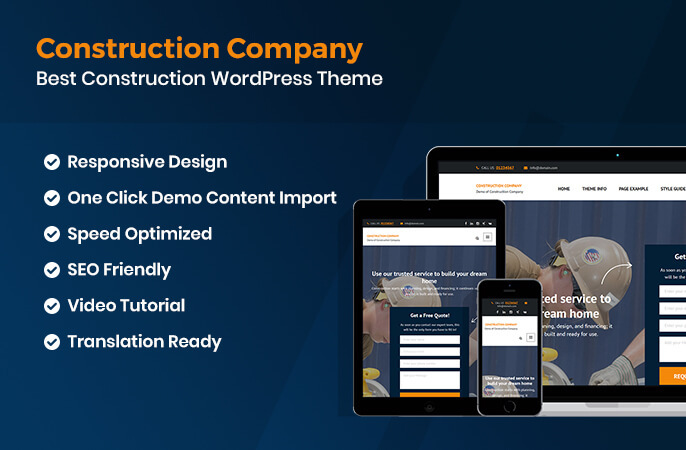 Construction Company template has influenced more than 4,000 small and large construction business owners to create quality websites using this theme. Those businesses have taken advantage of the lead generating contact forms on the banner section and other parts of the homepage to get more email inquiries and phone calls. With this theme, you can also create an impressive landing page to collect sales leads and initiate visitors’ interest to buy your service. Construction Company is the child theme of Construction Landing Page. This theme is something more than just a construction theme; it is more of a multipurpose theme that you can use for other kinds of businesses as well. Using Construction Company theme, you can build your mobile-friendly, cross-browser compatible, SEO-optimized, and super-fast loading website for free. Furthermore, you can integrate social media icons, upload logo, use an attractive image on the banner, show kind words of your clients, flaunt your partners, display your projects in the gallery, create your website in your local language, and do so much more. You are using WordPress to build your professional website for your business. You are looking for a free and responsive landing page web template for construction company, landscaping company, plumbing company, packers and movers company, architect company, or interior design company. You are a company looking to develop a website to display your services and reach out new leads. You are a small or a large business or an agency who wants to create a professional website to generate and capture leads. You want a clean, responsive design, SEO-friendly, and Speed Optimized landing page website template for free. Your client wants a beautiful, easy-to-use, and lead generating landing page website for their construction or building business in less time. Below are some of the key features of Construction Company WordPress template for creating construction business websites. You may have seen premium themes bragging about one click demo content import. However, so many free themes are short of this feature. Themes that do not have content demo import option make their users struggle with documentation and theme tutorials. But, if the theme you use lets you import content demo in a single click or a few clicks, you will have an easy way of installing the theme and setting up your site. With Construction Company template, we have got everything ready for you. So, kickstart your website with ready-made content and settings. You don’t have to spend hours making your website from scratch! Import all the images, text, and settings from the live demo of Construction Company WordPress theme with one click for free. We believe you should spend more time on your venture than on setting up your website. When it comes to drawing your websites visitors into your email inbox or phone, many websites fail right there. To address this issue, Construction Company theme has used above-the-fold areas which is very effective to put contact forms and other Call-To-Action buttons. The banner section on the homepage is among the most effective area for contact forms and any other lead generating a call to actions. We at Rara Theme have noticed this and implemented this on Construction Company theme. In this free construction business theme, you can add a contact form on the banner section in the above-the-fold area to increase email inquiries. The contact form has a very intense color composition which will instantly grab the attention of every visitor that your website gets. 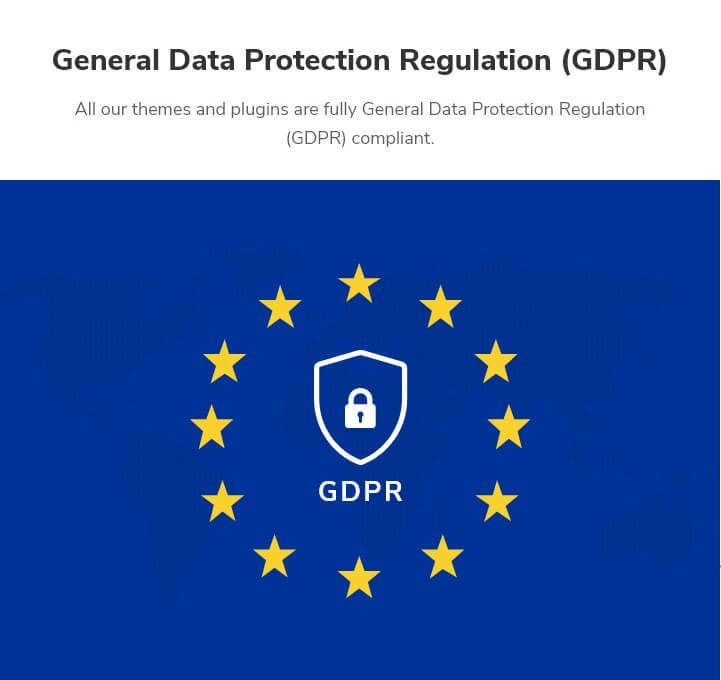 On top of that, contact forms have privacy guarantee assuring phrase at the bottom which helps you build the trust on visitors when they share their phone numbers and emails with you. The majority of traffic on websites come from mobile devices. Moreover, visitors coming from mobile devices tend to spend less time on websites as compared to desktop users. This is why your website must have mobile-friendly design and features that can keep mobile-users engaged. Construction Company theme is a mobile-friendly and fully responsive WordPress theme. The theme automatically adjusts itself to screen sizes of various mobile devices and tablets so that your website looks flawless on every device. You can reach a wide range of customers with a fully responsive and user-friendly design. In addition, having a mobile-friendly websites helps in increasing Google ranking of your company website. Search engines fall in love with websites made using Construction Company WordPress theme. We have put our expert SEO team’s knowledge and expertise into the development of the theme in such a way that search engines can easily find your website and rank it above your competitors on the search results page. Search engines can crawl every page of your website, understand the content effectively, and index those valuable pages. After indexing, the search engine will show your website’s relevant pages on the searched topics. Therefore, with Construction Company, your website’s performs much better in Google search result and chances of increase in website ranking is higher. Construction Company is a speed optimized WordPress theme, which means your website will load faster and your visitors will have a smooth browsing experience. The theme, with its speed, will help you build the fast and the best construction website, keep your customers engaged and get new leads easily. Your competitor’s website’s visitors may also turn to you if you have a faster and better-performing website than that of your competitor. Setting up your website is quite easy with Construction Company free theme. Want to learn how? Follow me. Construction Company comes with extensive theme documentation along with video tutorials to help you set up your website. The goal is to make you understand everything about setting up and using your website with the content tailored for your perspective. You will find it easy to understand every part of the documentation for an easy website set up. Moreover, the video tutorial will offer you an easy way to learn the whole website set up process visually. Just follow the step by step guidelines on the documentation and your website will be ready in no time. Construction Company theme has a clean and eye-catching design that will mesmerize your visitors. The theme will create a good long-lasting impression on your users. Too much sparkling and colorful designs may discourage visitors to buy your service. Therefore, this free construction website template avoids unnecessary extras to let you build a website with neat, functional, and alluring design. The homepage and subpages are clean and equally attractive and CTA sections are enticing to sell services. Construction Company free theme has ample space for widgets. The results? You get better design and control of your website. You can decide what should show up in each section of your sidebar and footer. Arrange widget items like Categories, Archives, Recent Posts, and more on those sections. You can add and manage the widgets you require without compromising the design of the theme. Widget ready design and code allow you to easily customize your website as you desire. Clean coding is an art that not every programmer masters. The techniques are many. But, the formula is simple. We make sure codes on this construction theme are easy to read, maintain, and extend. And its benefits? Website maintenance is easier, search engines understand you better, customization is less complicated, and finding any issue becomes painless. Want to modify some CSS effects or change color of a section? Construction Company allows you to easily add CSS3 animations right from the customizer. Add your own custom logo on your website using Construction Company theme. You can place your logo on the top of your website where people can’t help them from noticing it. Got confusions, questions or ideas? We are here to help you. You can contact our friendly support team through our support ticket if you need any assistance regarding the theme. If documentation, FAQs, and video tutorials could not solve your problem, our support crew will assist you in installing the theme and make it work in the best way. We offer support on theme installation, fix bugs, and answer technical questions about the theme features. Your website must look good and function fully on every visitor’s device. So, to provide consistent user-experience, cross-browser compatibility is a must-have feature of a website. We have tested Construction Company free WordPress theme with the latest version of Chrome, Mozilla Firefox, Edge, and Safari. And, the theme looks and works great on all major browsers. Fine-tune and customize the way your website looks, and live preview the changes in real time with built-in live customizer. Every change you make on your website, you can test it how it looks before making the change live. The result? Customization becomes a lot easier. You will know if anything goes wrong before making the change on the website. Construction Company template allows you to display your social media links on your website so that your visitors can find you on social media. Social media on your website helps you cross-promote your website and boost your business’ engagement. The theme also supports Russian and Chinese social media like OK, VK, Zing, and others. You can add unlimited social media on your website. Don't want to be left behind? Construction Company comes with regular updates. We frequently update our themes for the latest security and technical standards. So, your website will be safe from vulnerabilities. Have construction products to sell? Construction Company theme is the right theme for you. The theme is WooCommerce plugin ready. With this eCommerce plugin, you can easily create an online shop to sell products on your website. With this WordPress plugin, you can create and manage your online store easily. The plugin blends perfectly with Construction Company free theme to give you more flexibility and rich sets of features like safe payments and shipping integration. This way, WooCommerce compatibility of Construction Company helps you sell products through your website and grow your business. With a business website, you definitely want your visitors to sign up or take some actions. But... Is your service selling page good enough? Does your website persuade visitors to contact you? And buy your services? Construction Company free WordPress theme has used lead generating sections in prominent areas. It has kept Call-To-Action sections and contact forms accurately in an engaging and impressive manner. Build your website with this, and you become unstoppable. The strategically-placed CTA sections of this theme will help you get more conversions. The Get A Quote contact form on the banner section attracts visitors’ attention instantly to encourage users to contact you. Other contact forms and Call To Action buttons are equally effective as well. People like reading what other people have to say about an organization. Social proof is an extremely powerful tool that gives your website authority and builds trust to get more customers. So, pour kind words of your clients on your website on the testimonial section. Show what other people are saying about your construction, structure, engineering or infrastructure business. Construction Company template has a compelling testimonial section that lets you show off how others have benefitted from your service. So, with the help of this powerful tool, you will not just establish trust but encourage interested buyers to close the deal with your company. In the end, your business runs by selling services. Construction Company WordPress theme has a beautifully-built service section on the homepage that gives your visitors a clear idea about what services you offer. The section uses the parallax effect which makes this section quite appealing. For those visitors who want to know more about the service, you can then redirect them to service pages from this section. The portfolio section is great for your website both visually and functionally. Construction Company WordPress theme has an attractive portfolio section where you can use alluring images to grab the attention of your visitors. Win the hearts of your customer with images of your previous works, experience, and accomplishments. Since you may struggle to sell your services with only contents, the portfolio helps you build trust among visitors. Legibility, in simple terms, is the quality of being clear to read. With the perfect font type, size, spaces, and contrast, Construction Company theme makes sure that your content is easy on the eye and your visitors enjoy reading what you have to say. In this theme. there are no typefaces too quirky or too fussy that diminish legibility. So, with this theme, you get favorable advantages over others. Not just easy legibility. Better readability. Construction Company theme doesn’t let the language barrier come between you and your website. This translation-ready theme supports localization so that you can use the theme in your local language. Arabic, Hebrew, Persian (RTL) - You name it. Do you use right-to-left (RTL) scripts like Arabic? Well, worry not! Construction Company free WordPress template supports both LTR and RTL languages. You can write content with confidence! So, with this theme, you can build websites in various languages. Can I use this WordPress theme for other purposes? Construction Company, though built for the construction industry, can also be used for other businesses and purposes. This theme has the quality and features of multipurpose themes. You can use this theme to build business websites related to education, hotel, consulting, sports, fitness, beauty, and more. Can I change the color of my website? Construction Company provides you with unlimited color options for the background. But, if you want to change primary and secondary colors, you have to upgrade to Construction Landing Page Pro WordPress theme. What if I want to change the font of my website? Don’t worry. The theme options let you choose from 600+ Google fonts for the primary font. But, if you want to choose different fonts for the heading, subheading, and body, you will have to upgrade up to Construction Landing Page Pro. Construction Company has a single, thoughtfully-built header style aligned in the center on the top. You can add a phone number, phone label, e-mail address, and also enable or disable social links on the header. What are the major customization options the theme offers? Besides the background color primary font options, the theme options lets you choose your own background image, change the logo, create site title with a tagline, and add site icons and font awesome icons. You can create a menu, name menu items, and reorder them. You can also make changes on copyright info, add widgets on the right sidebar and footer, and enable breadcrumb. You can perform all these customizations easily from the admin panel. The pro version has much more customisation features. Can I customize the homepage sections? With this theme, you can decide which sections to show on the homepage from the lists of homepage sections like banner section, about section, portfolio section, services section, testimonials section, contact form section and more. You can reorder them as you like to make your website more efficient. On top of that, each section offers you a few options on how to display those sections on your website. Do you use Revolution Slider? No, we do not use external sliders like Slider Revolution WordPress Plugin as they make your website slow and decline the performance. We have our own built-in slider that is available only on the paid version of Construction Company. On the premium version, you can create charming full-width sliders using page, category, or custom fields. You can also customize the slider speed and animation as you like on the premium version. Does this theme use external page builder plugins? Construction Company does not use any external drag and drop page and site builders like Elementor, Visual Composer or SiteOrigin. Using such foreign drag and drop page builders, either free or premium plugins, make your website heavy and slow. Having said that, we plan to make the theme compatible with some of the popular drag and drop page builder plugins. Construction Company lets you build additional subpages and inner pages easily. While building new inner pages, you have the option to choose from the two-page templates - homepage and default (blog) template. You can choose from page layout options with a right sidebar or without the sidebar. Does this theme have custom widgets? Yes, the theme has four custom widgets - Featured Posts, Popular Posts, Recent Posts, and Social Links. What post formats does this theme offer? With this theme, you will have all post types including standard, image, quote, link, video, audio, chat, and more. Does the theme have sidebar options? This theme comes with page layouts with right sidebar or no sidebar options. For unlimited sidebar options, you have to buy the premium version of this theme. Is Construction Company theme translation ready? Yes, the theme supports localization which lets you use this theme in your local language. Does Construction Company theme support the multilingual website? The pro version i.e. Construction Landing Page Pro supports multilingual websites. It is fully compatible with WPML and Polylang plugins, which are two of the most popular for creating multilingual websites. Does this theme have a blog page? Construction Company comes with beautiful blog layout with the widget area on the right sidebar. Is Construction Company template really free? We won’t charge you for using Construction Company WordPress theme. And, there’s no catch!